Custom Widgets might contain confidential information, like the credentials of your BizTalk360 Service Account. Of course, you don’t want this information to be revealed in plain text in your widgets. To hide such confidential information, you can use Placeholders. Beside using Placeholders to hide confidential information, you can also use them for providing frequently used data to your Custom Widgets. Think of for example, the BizTalk360 EnvironmentId, which is a value which often needs to be provided to Custom Widgets. By creating a Placeholder for the EnvironmentId, you can easily re-use it and you don’t need to search for such values, each time you are creating a Custom Widget which needs such a value. 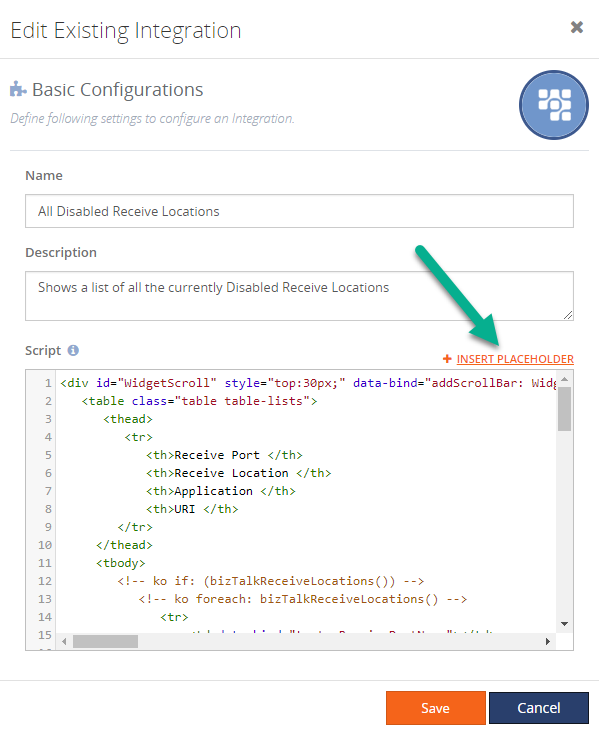 To be able to create Placeholders and use them in a Custom Widget, you need to open a Custom Widget. As mentioned, for this scenario, the ‘All disabled Receive Locations’ widget will be used. Further, you can use the green checkmark to save the placeholder or the red cross to abort creating the placeholder. The values of the placeholders can be viewed by hovering over the eye icon next to each value. 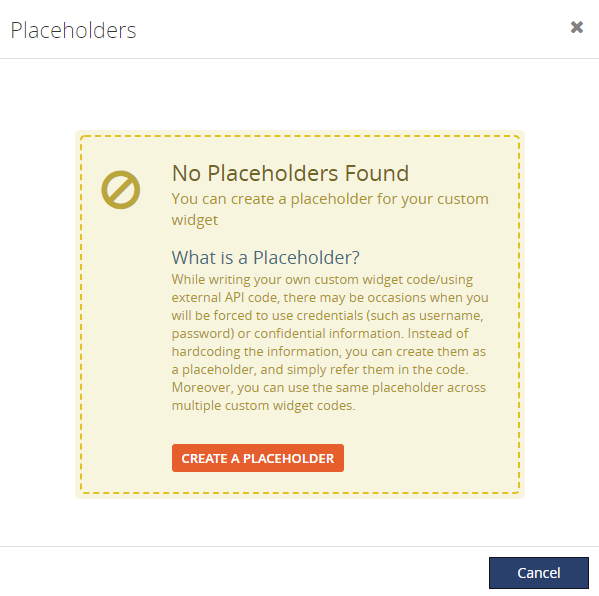 In the next step, we will see how you can use the created placeholders in a custom widget. With the Placeholders screen still open, you will also see the Custom Widget to which you want to apply the placeholders, including the 3 fields for which we created placeholders. Next, move the cursor in between the double quotes of the field ‘username’. 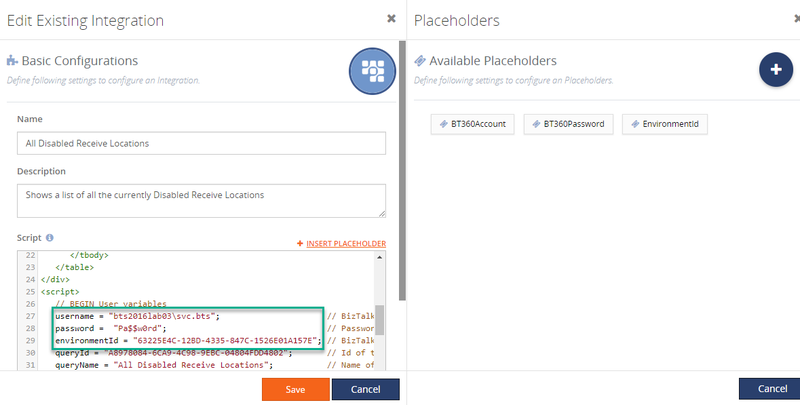 To apply a placeholder to that field ‘username’, you must click on that placeholder in the Placeholder screen. 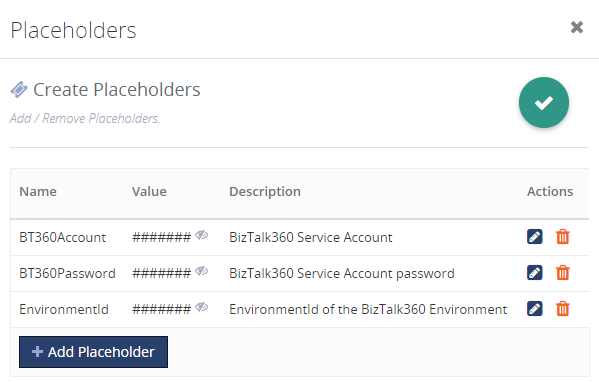 In this case, we need the BizTalk360 account, so click the ‘BT360Account’ placeholder. If all steps have been performed correctly, the Custom Widget still works fine, but it won’t reveal the confidential BizTalk360 Service Account.